Manda de Laos is enveloped by the historic beauty of three lotus ponds, registered as a UNESCO World Heritage Site since 1995, creating an immersive tropical ambiance. The dining area overlooks a magical display of lotus blossoms and floating lilies, while the changing colours of the sky through to dusk, allows guests to dine in candlelit serenity under the stars. Signature dishes, include “Khoua Sin Kwai” (wok fried buffalo and flambé with Lao Lao alcohol), “Laap Moo” (a special dish inspired by traditional minced pork recipe of Toune’s mother) and “Ping Pa” (grilled famous Pa Nin fish with lemongrass and Lao herbs, served with homemade tomato maklen). Manda de Laos’ Signature Cocktails feature Lao ingredients and flavors combined with a unique blend of legacy, modernity and innovation, such as the “Laos Parinha” (Champa Kao with cucumber and lime rimmed with local ground rice). Dine under the stars around the serenity of the ancient lotus pond and immerse in tropical ambience. Enveloped by coconut trees, the waters are filled with floating lilies, beguiling lotus flowers and shimmering candles at night, and the decking elegantly set with large tables and sofas to suit the most romantic of evenings. 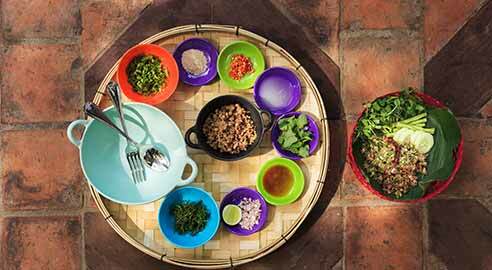 Laotian family cuisine with specialties from all regions of Laos, carrying on the traditions and spirit of "Mama Phiew" (Manda means "Mother" in Laotian), dedicated to sharing how one cooked and ate in the past. “The creation of Manda de Laos was drawn from the inspiration and influence of “Mama Phiew”, and is dedicated to sharing how one cooked and ate in the past. Founder, Toune Sisouphanthavong, describes her mother’s story. My mother, Mama Phiew, was born in 1930 in Luang Prabang, the eldest of three children. Like all young ladies in Luang Prabang of that time, Mama Phiew learned to cook traditional Lao dishes from her own mother. When she married my father and had 10 children including five girls, she passed her knowledge and love of Lao cooking along to us. Mama Phiew’s daily life was spent looking after her family and her small business. She always focused on her children’s welfare, particularly our meals, for which she showed great passion and attention to detail. In the days before fast food and eating out, traditional dishes such as ‘Laap’ required a full day of preparation, and nothing left to chance or guesswork. From the main street of Luang Prabang go straight to the west direction and turn left on the street in front of the Vietnamese Consulate.